The historians in general considered the rapid growth of population in England in the 18th and 19th centuries as more of a consequence than cause of the Industrial Revolution. The recent historical studies, based on thorough demographic research, have reversed this traditional thinking. For detailed study stetee M.W. Flinn, British Population Growth 1700-1850. London, 1970; H. J. Habakkuk, Population Growth and Economic Development Since 1970. London, 1971, W. B. Willcox and W. L. Arnstein, The Age of Aristocracy 1688-1830. Toronto 1978. All these demographic historians have clearly proved that the mid-18th century onset of rapid population growth coincided with, rather than followed, industrialization, and in that process helped the Industrial Revolution to move forward. The population of England and Wales increased by 15-20 percent between 1695 and 1750, by 50-60 percent between 1750 and 1801, and by nearly 100 percent between 1801 and 1851. To make it more clear, in 1695 the population figure stood at five and half millions, and by 1750 it increased to 6 millions. From `1750 the growth was rapid and in the next half century it reached 9 millions. This was doubled by 1851 to become 18 millions, and doubled again by 1901 to become 36 millions. This fairly large population became a major factor of the Industrial Revolution. It provided abundant human resources necessary for industrial development. It provided a vast labour force absorbed in mines, factories, docks and construction works. The population growth not only provided the labour force, but also created huge technical man-power and a sizeable section of the entrepreneurial class. This is a very significant aspect of the population growth. The most potential beneficiaries of the better food and better medical facilities had been the middle and lower middle classes. The children born in these middle class families had a high survival rate. This, according to Prof. Plumb, was “the greatest stimulant of all”. The growing world of industrial activities offered them numerous opportunities of advancements. With some education, a little capital and the support of some influential relative, an enterprising youngmen belonging to ordinary or lower middle classes could make a wonderful success story. 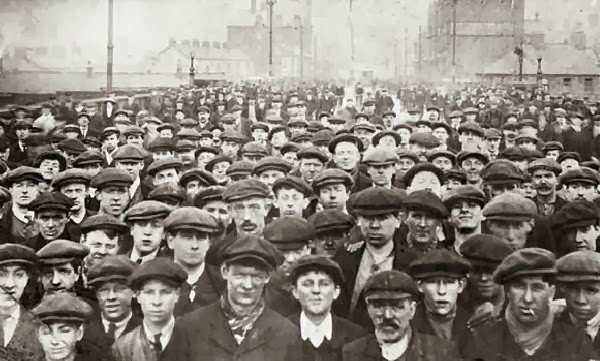 The early industrial capitalists – Walt, Wedgewood, Arkwright, Fielden, Peel, Wilkinson and many others – all came from the lower middle class. Thus, the population growth and Industrial Revolution were at the outset independent phenomena but became inter-dependent as time passed on.